ZOË RUIZ lives and writes in Los Angeles. Her writing has appeared or is forthcoming in The Believer, The Millions, Marketplace, The Rumpus, Salon, Two Serious Ladies, and the anthologies California Prose Directory (2014), Rooted, and Golden State. She is also the Events Director at The Last Bookstore as well as a freelance book editor and book publicist. BRIAN EVENSON is the author of a dozen books of fiction, most recently the story collection A Collapse of Horses (Coffee House Press 2016) and the novella The Warren (Tor.com 2016). He has also recently published Windeye (Coffee House Press 2012) and Immobility (Tor 2012), both of which were finalists for a Shirley Jackson Award. His novel Last Days won the American Library Association's award for Best Horror Novel of 2009. His novel The Open Curtain (Coffee House Press) was a finalist for an Edgar Award and an International Horror Guild Award. Other books include The Wavering Knife (which won the IHG Award for best story collection), Dark Property, and Altmann's Tongue. He has translated work by Christian Gailly, Jean Frémon, Claro, Jacques Jouet, Eric Chevillard, Antoine Volodine, Manuela Draeger, and David B. He is the recipient of three O. Henry Prizes as well as an NEA fellowship. His work has been translated into French, Italian, Greek Spanish, Japanese, Persian, and Slovenian. He lives in Los Angeles and teaches in the Critical Studies Program at CalArts. 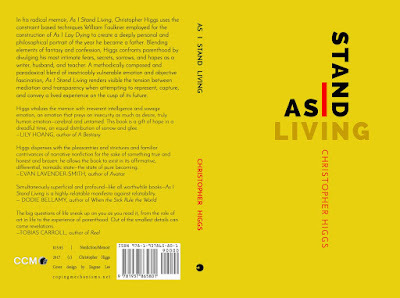 CHRISTOPHER HIGGS lives in Los Angeles with his wife and son, where he teaches narrative theory and technique at Cal State Northridge. He wrote The Complete Works of Marvin K. Mooney: a novel, released by Sator Press, and he assembled the SPD #1 Bestselling novel ONE, in collaboration with Blake Butler and Vanessa Place, released by Roof Books. In addition to publishing two chapbooks, Colorless Green Ideas Sleep Furiously (Publishing Genius) and Becoming Monster (The Cupboard), he’s written for numerous print and online venues, including: Pleiades, New Theory, Diagram, AGNI, Denver Quarterly, Global Queer Cinema, and The Paris Review Daily. Interesting advice. I have one very successful website and now I’m trying to see if I can revive six blogs at once. cla safflower oil On a very basic level from the item is a touch of dietary programming that can take these contributions from the client after which comes about a customized count calories orchestrate the buyer as indicated by people attributes and in addition their objectives for losing muscle to fat ratio ratios.